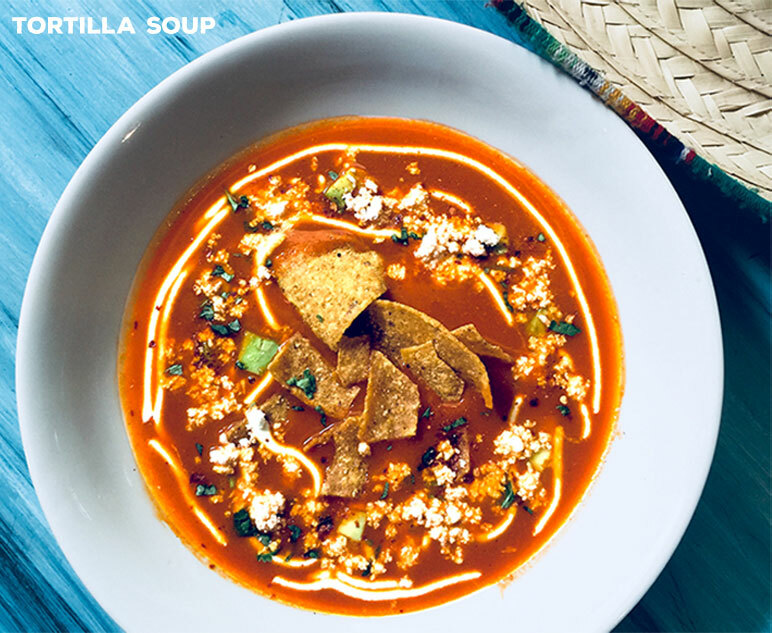 Traditional Mexican soup, rich tomato broth with garlic, onions & chili de Arbol Topped with crispy tortilla strips, fresh avocado & DF homemade Queso Fresco cheese & crema. Fresh Guacamole topped with Pico de Gallo. Served with DF homemade corn chips. Corn tortilla folded, stuffed & deep fried. 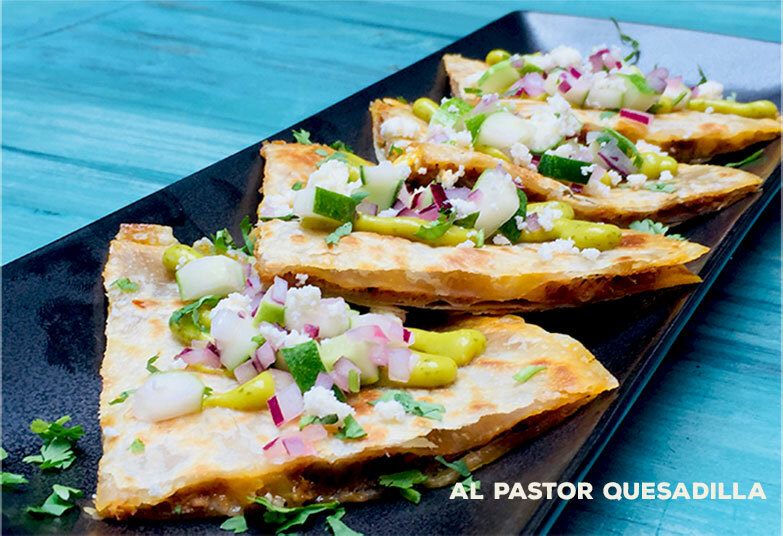 Outside of DF it is called an Empanada, in DF we call it a Quesadilla. Fresh corn tortilla, stuffed with homemade chorizo & cheese, folded & deep fried to crispy. Topped with crema, red cabbage & DF homemade cheese. Sometimes mistaken as an Empanada.. Our DF Quesadilla, is a fresh corn tortilla, stuffed with potato & cheese, folded & deep fried to crispy. Topped with crema iceberg & DF homemade cheese. 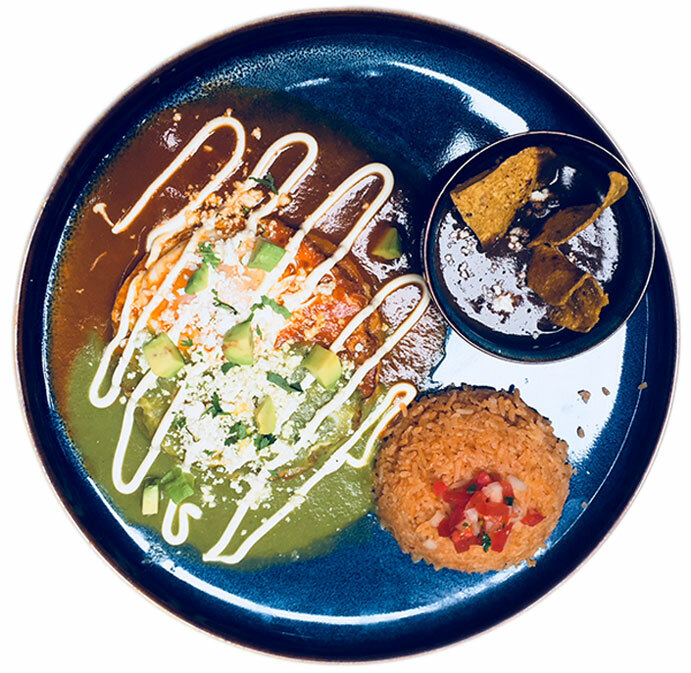 Two flour tortillas, stuffed with your choice of: Chicken Tinga or Pork Al Pastor with Pineapple Topped with avocado creama & Pico de Gallo. Prawns, octopus, clams, in clamato, pico de gallo, avocado & lime. Sea Bass cured in lime with mango, cucumber, red onion, jicama, chili & avocado crema. Rocket, romaine & radicchio, tossed with fennel fresh apple slices, orange segments & granola. Drizzled with orange & mint dressing. 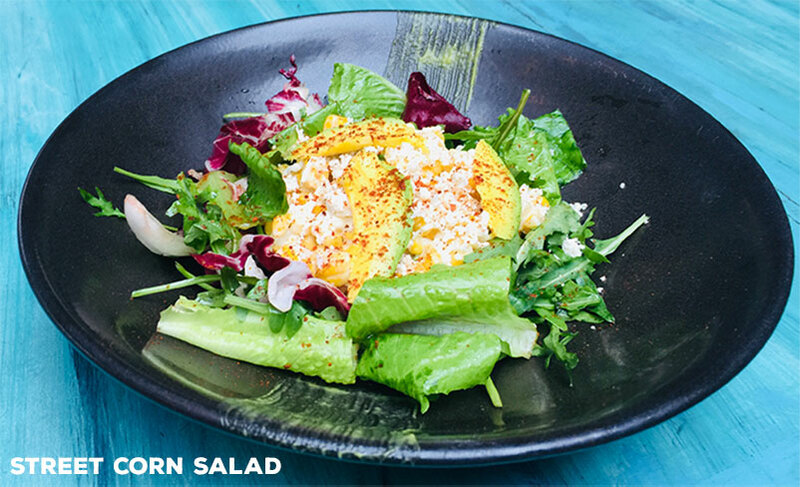 Sweet corn, avocado, onion, chili, lime, with DF home made fresh cheese. Baby tomatoes, cucumber, red cabbage, avocado, onion, peanuts & black sesame. Jalapeno, cilantro & olive oil dressing. Spinach mixed with fresh corn masa, formed into a pocket, stuffed with cream cheese, sweet corn & jalapeno. Topped with a spring onion crema & fresh cheese. Homemade corn masa dough & butter, steamed in a corn husk topped with mixed sauteed bell peppers & crema. Mini crunchy tortillas, deep fried & stuffed with choice of chicken tinga, pork carnitas or carne con chili (Beef). Topped with avocado crema & green pico de gallo. 3 fried corn masa tortillas stuffed with chicken tinga. 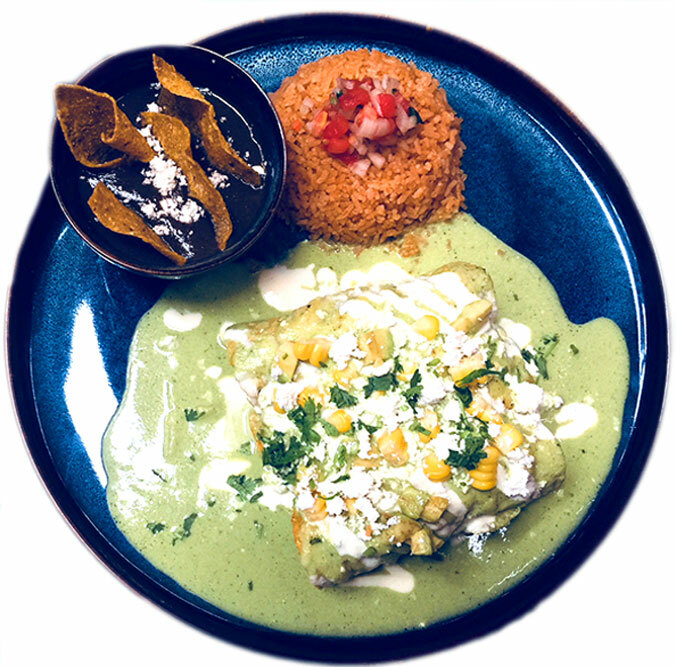 Topped with creamy green salsa verde, fresh cheese, sweet corn & crema. Served with Mexican rice & refried beans. 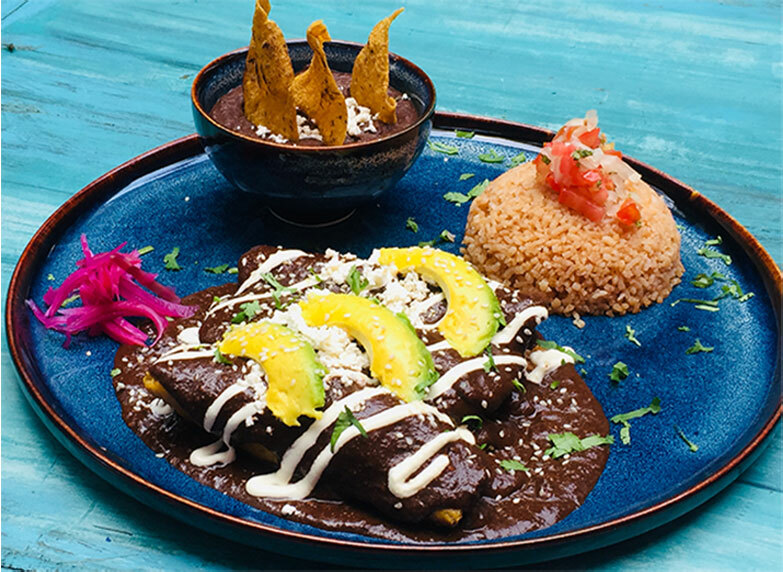 pronounced as Mo Lay, Mole Poblano, a very traditional dish of Mexico, originating in ancient times from the state of Puebla in the highlands of southern central Mexico. Mole Poblano is a dark rich red brown sauce that usually accompanies poultry. it is very complex sauce that contains approx 25 ingredients. the main ones are various chili peppers, chocolate, plantains, almonds, pumpkin seeds, cinnamon sticks, anise, and cloves. A rich complex full flavoured sauce. 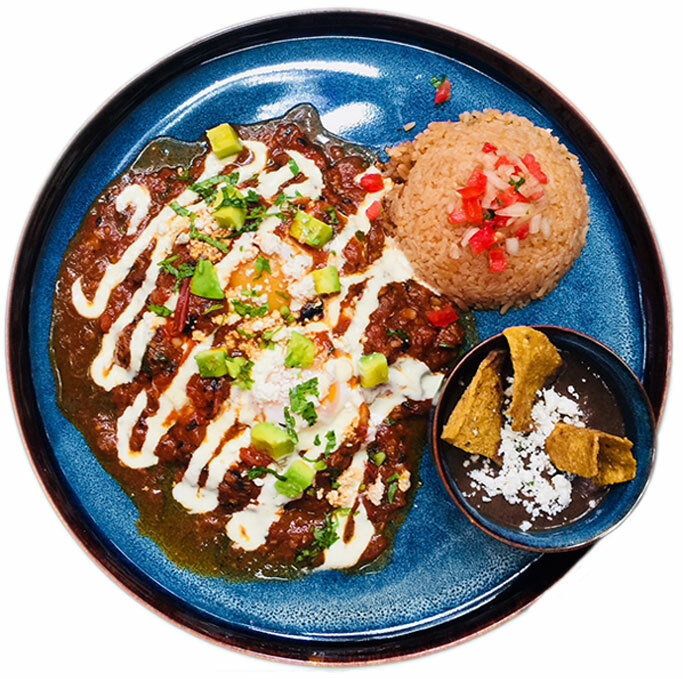 3 Corn Soft Tacos stuffed with Chicken Tinga, topped with a rich Mole Poblano sauce, DF homemade cheese & crema,refried beans & Mexican rice. ALTHOUGH MOLE VERDE IS NOT AS COMPLEX AS MOLE POBLANO, IT STILL CONTAINS MORE THAN 15 INGREDIENTS. IT IS A FRESH TASTING MOLE THAT IS MILDLY SPICY. the main ingredients are green chilis jalapeño, cilantro, tomatillos, pumpkin seeds A lighter more subtle fresh flavour. 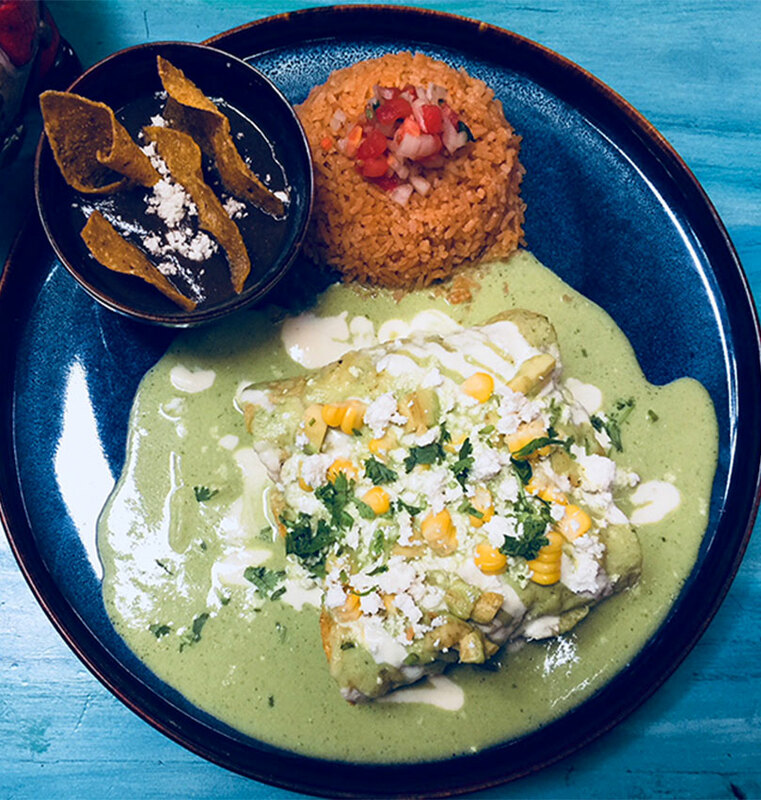 3 corn tacos stuffed with pork carnitas, topped with a fresh mildly spicy mole verde sauce, DF homemade cheese & crema, refried beans & Mexican rice. Traditional Mexican soup, rich tomato broth with garlic, onions & chili de Arbol. Tortilla strips, avocado, DF homemade cheese & crema. Mini crunchy tortillas, deep fried & stuffed with choice of chicken tinga, pork carnitas or carne con chili. Topped with avocado crema & green pico de gallo. 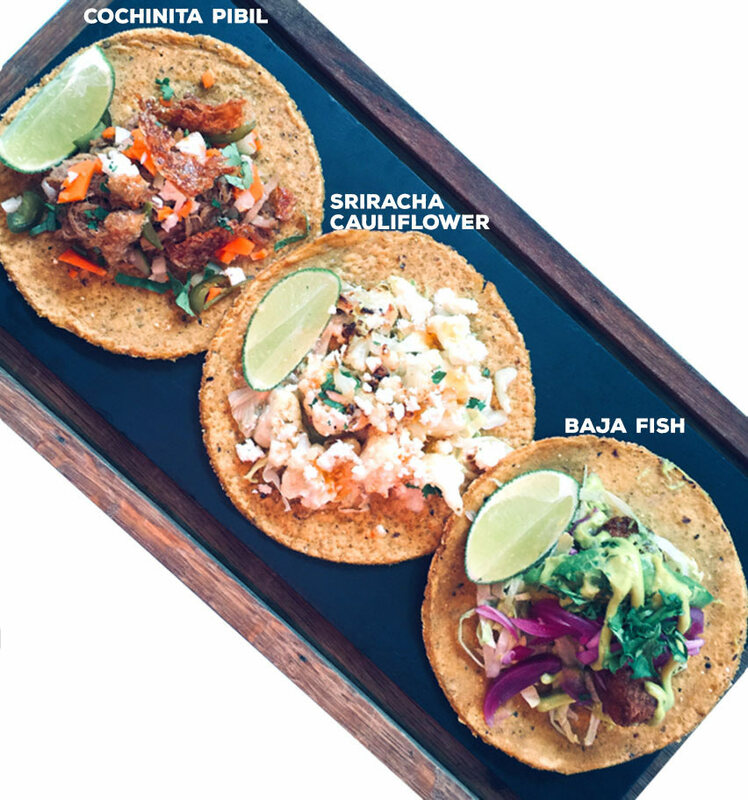 Daily made fresh corn masa tacos with your choice of toppings from our taco menu. A delicious flour based dough that is deep fried to crispy & rolled in a mixture of cinnamon & sugar. Served with home made caramel & chocolate sauce. Guacamole, refried beans, molten cheese & chorizo, served with DF homemade corn chips. Two flour tortillas, Your choice of: Chicken Tinga or Pork Al Pastor with Pineapple Topped with avocado creama & Pico de Gallo. 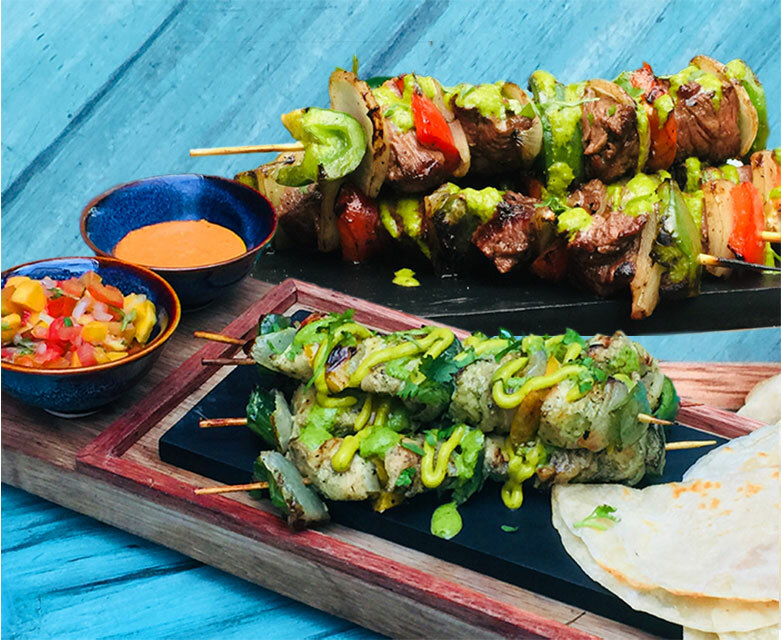 Chicken thigh, marinated & cubed on to 4 skewers with red & yellow bell peppers Char-grilled & served with 4 flour tortillas, topped with Chimichuri sauce & avocado crema. Served with Guacamole & Mango Pico de Gallo. 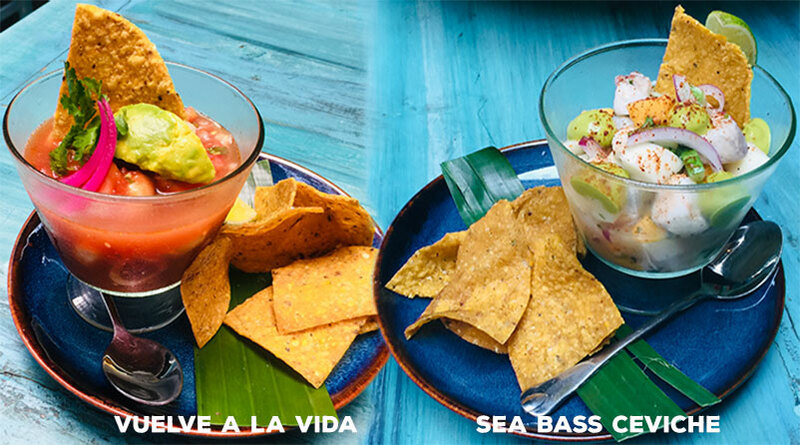 Choose either Poblano or Verde above. 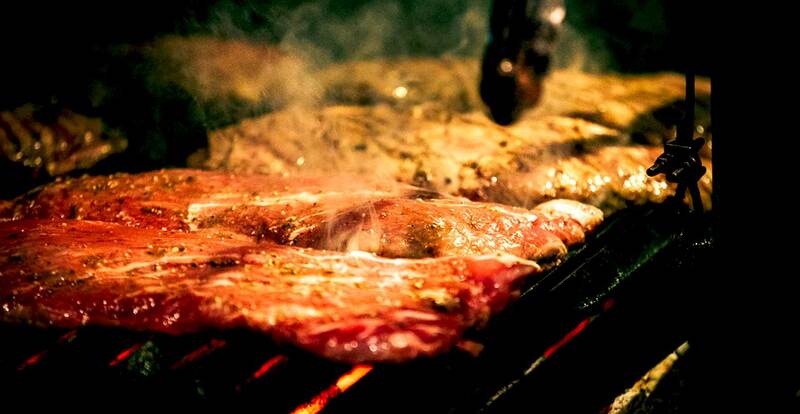 Australian Iron steak, char-grilled & sliced. Topped with our DF chimichuri sauce. Served with fried potatoes or mixed side salad. Plus 2 side dishes of your choice. 2 Ears of corn cut in half, grilled, dressed with home made aioli, fresh home made cheese, chili for spice and served up with fresh lime. Flour based dough deep fried to crispy,rolled in a mixture of cinnamon & sugar. Served with home made caramel & chocolate sauce. 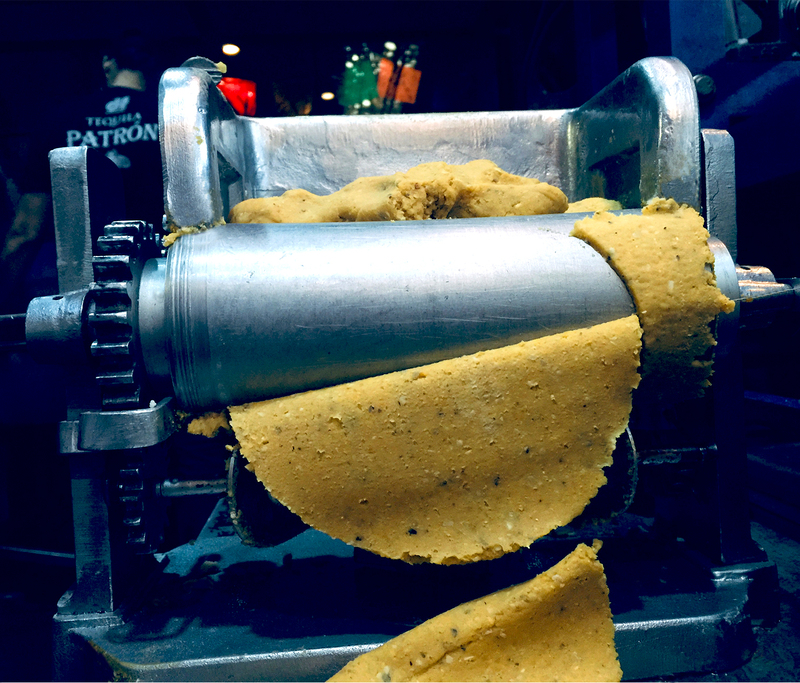 The majority of Mexican restaurants across the globe purchase ready made corn tortillas, due to the time consuming & complex process of preparing their own tortillas... who can blame them. 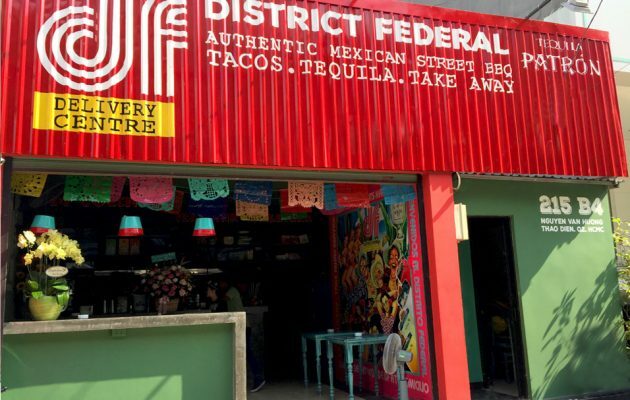 However, at District Federal, we relish the challenge and complexity, for the pursuit of true Mexican authenticity & flavours. 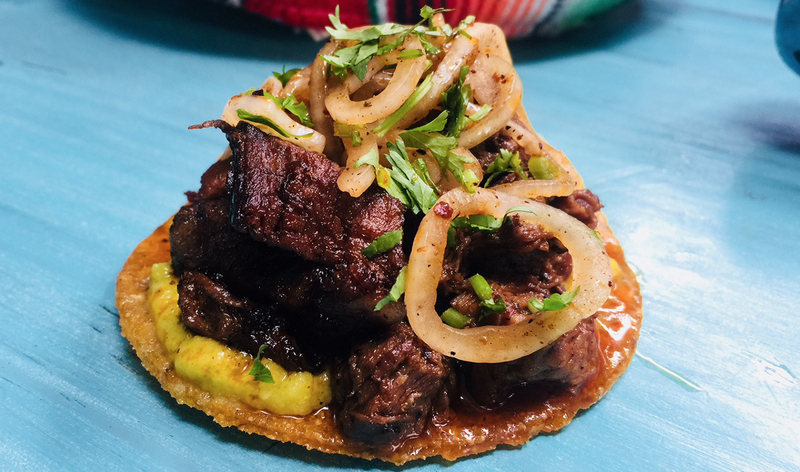 After Twenty hours of preparing and processing the dried yellow corn, we deliver you fresh daily tortillas for Tacos, Corn Chips & Tostadas, so that you can experience the real taste of Mexico in Vietnam. Slow cooked chicken thigh with tomato,onions & chipotle chili. DF homemade cheese & crema & iceberg lettuce. 8 hr slow cooked pork leg with jalapeno & spices. Topped pickled vegetables & pork crispy chicharon. 8hr slow cooked Australian chili crusted Beef Brisket. Served over guacamole, topped with marinated onions & cilantro. Slow cooked pork leg with oranges, achiote, garlic & spices. Topped with onions & cilantro. Deep fried battered sea bass, topped with homemade avocado cilantro aioli, iceberg & avocado slices. Pan fried lime garlic prawns, topped with red onion escabeche, iceberg lettuce & avocado. Pork rib meat, over melted cheese base, topped with green Pico de Gallo Verde, avocado crema & grilled pineapple. Masceca corn tortilla with peach & plum sauce base. Topped with slow cooked duck confit, iced cucumber,spring onions & crispy duck skin. Char-grilled pumpkin, on iceberg lettuce topped with MX mixed nut & caramel granola & char-grilled jalapeno crema. Roasted cauliflower, with sriracha chili aioli. Topped with iceberg, red cabbage & crema. HOWEVER, WE TWIST IT A LITTLE.... BRINGING IT CLOSER TO MEXICAN THAN MEXICAN’T. 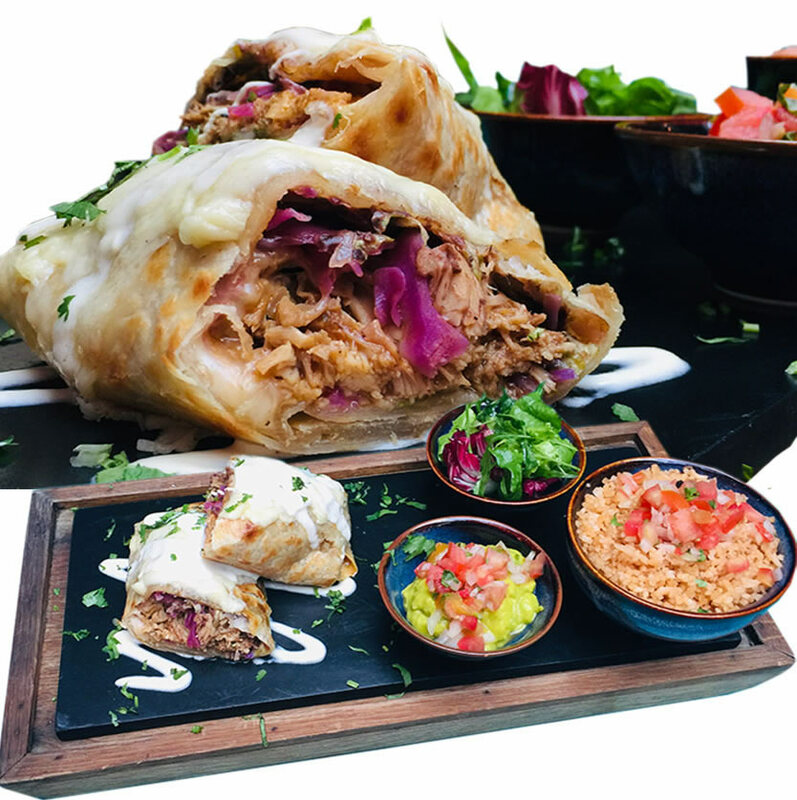 DF Burritos are made from a flour tortilla, stuffed with refried beans, 2 cheeses, iceberg, red cabbage & your choice of one filling below. Oven baked, topped with cheese & crema. Served with Mexican rice & guacamole on the side. 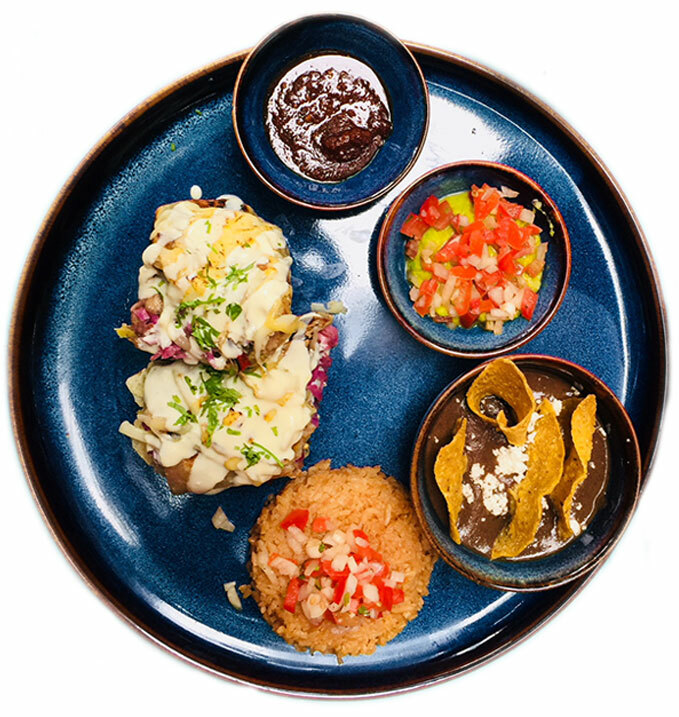 choose one of the Fillings below for your burrito. Char grilled 125g Australian Iron Steak, with green & red bell peppers. Chicken breast, slow cooked with tomatoes, onions & smoky chipotle chili. 8 hr slow cooked pork leg with jalapeno, oregano, onions, cumin & spices. Australian chili crusted Beef Brisket 8 hr slow cooked with Secret Mex spices. Grilled assorted bell peppers, zucchini & cauliflower. Chicken thigh, marinated & cubed on to 4 skewers with red & yellow bell peppers & onion. 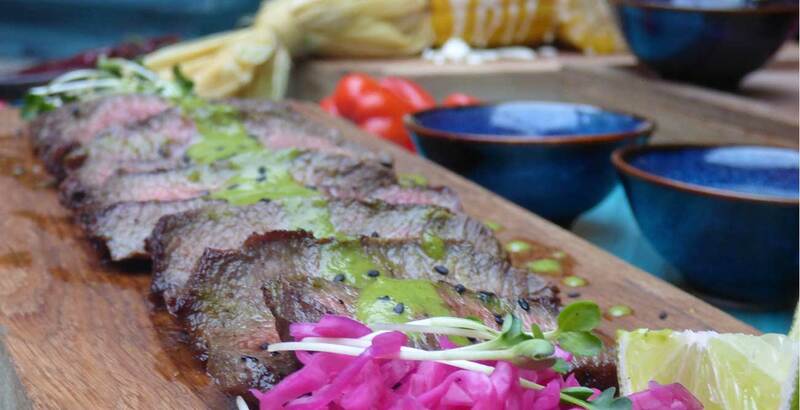 Char-grilled & served with 4 flour tortillas, topped with Chimichuri sauce & avocado crema. Served with Guacamole & Mango Pico de Gallo on the side. Australian Iron Steak, seasoned char-grilled with red & green bell peppers & onions. 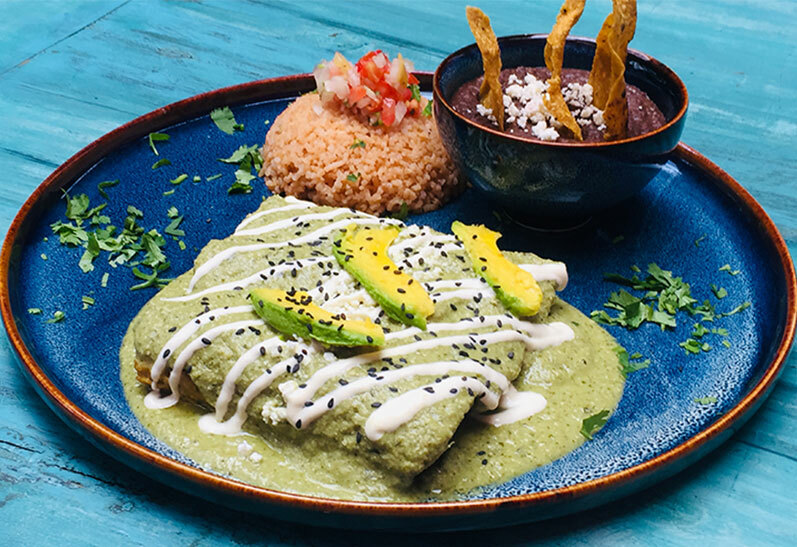 Served with 4 flour tortillas, topped with Chimichuri sauce & avocado crema. Served with Pico de Gallo. 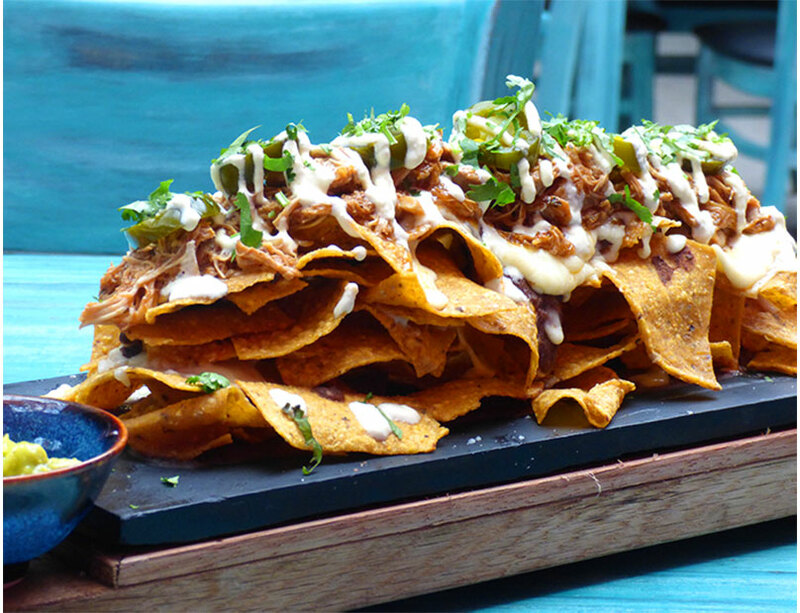 Not something you find in centro df however, DF Nachos are made from our own homemade corn masa chips, Layered with refried beans & two cheeses. served with your choice of the toppings below. finished with homemade crema & fresh cheese & jalapeno. Served with Guacamole & Pico de Gallo. 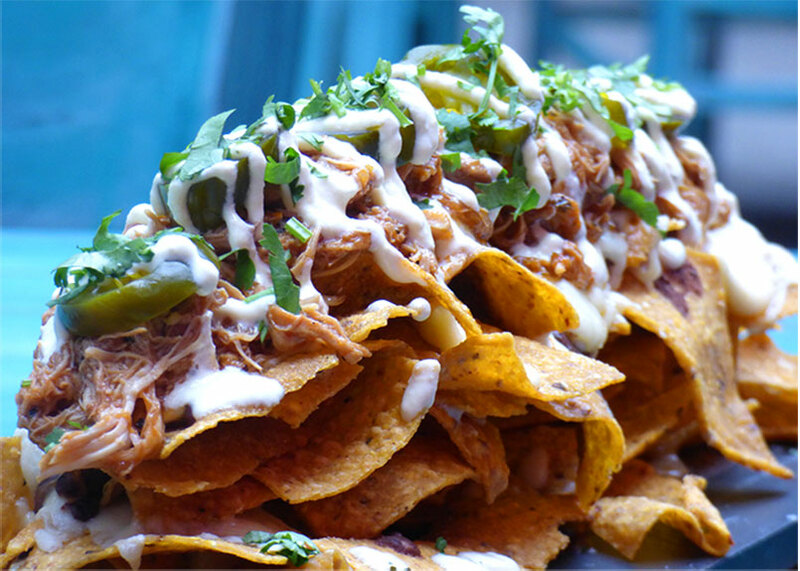 Nachos topped with your choice of. 8 hr slow cooked pork leg with jalapeno, oregano, cumin & spices. Australian chili crusted Beef Brisket 8 hr slow cooked with MX (Secret) spices. Nachos topped with extra cheese. Mexican CCC, NOT the Tex Mex version of minced beef & kidney beans! 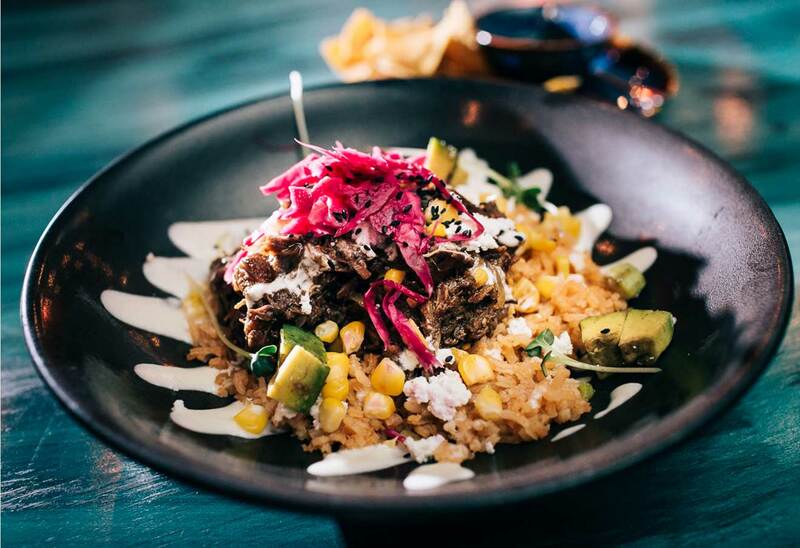 Australian chili crusted Beef Brisket 8 hr slow cooked with MX (Secret) spices, over Mexican rice, refried beans, with avocado slices & fresh street corn. Topped with DF homemade cheese & crema, red pickled cabbage. Served with refried beans & corn chips on the side. using Argentinian style adjustable grills, we are able to control the cooking temperature, to ensure a perfect sear and an even cook. we cook on charcoal, to give the smoky characters only achievable with this method of bbq grilling. 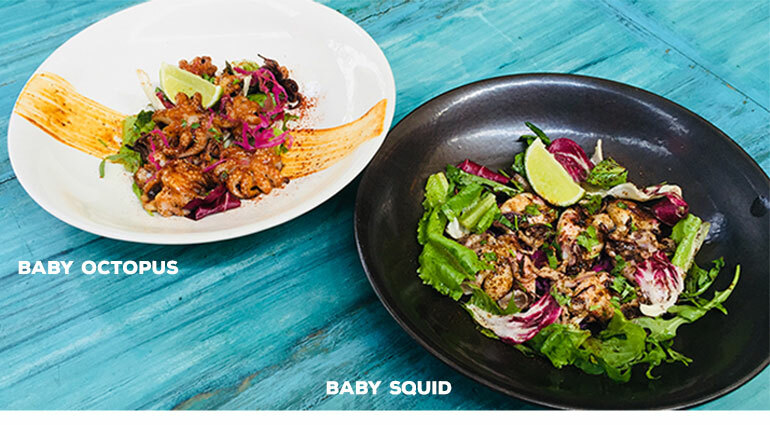 Marinated baby octopus char-grilled in chipotle sauce, served on a bed of mixed lettuce leaves. Marinated in lime & garlic, then char-grilled & served on a bed of iceberg & red cabbage. 250g Sea Bass Fillet, marinated in chili brine, pan sauteed & oven baked. Topped with a zucchini, corn salsa & salsa verde. Served with green leaf, onion & tomato salad. DF flat iron steak has all of the connective tissue and silver skin removed. This enables the meat to be cut into easily and ensure that our portions are lean, extremely tender, juicy and full of flavour. 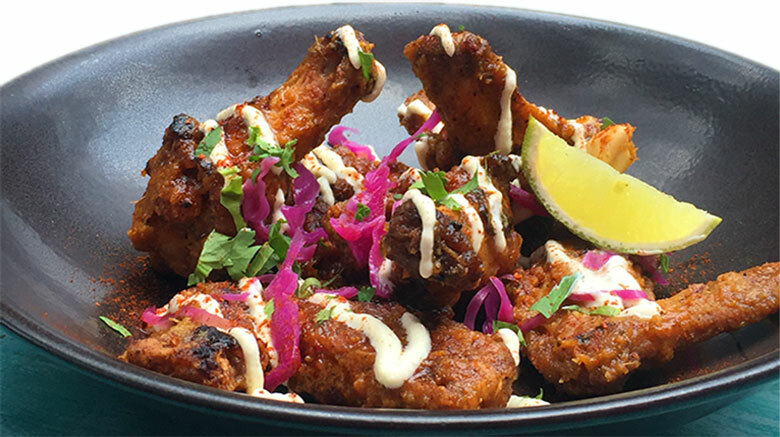 Marinated wings, lightly floured in spices, deep fried & flash char-grilled to finish. Coated with our spicy habenero chili & pineapple salsa.. HOT! Served with a generous topping of DF crema. Mexican style grilled corn also called Elote is a popular Mexican street snack found throughout Mexico. Ears of corn husks, grilled, dressed with home made aioli, fresh home made cheese, chili for spice and served up with fresh lime. The smokiness of the grill pairs perfectly with the sweet corn and the tangy toppings. If you don’t want the spice, please let us know. Pre steamed sweet potato, grilled on the BBQ, coated in smokey Chipotle chili sauce & topped with creama & home made fresh cheese. 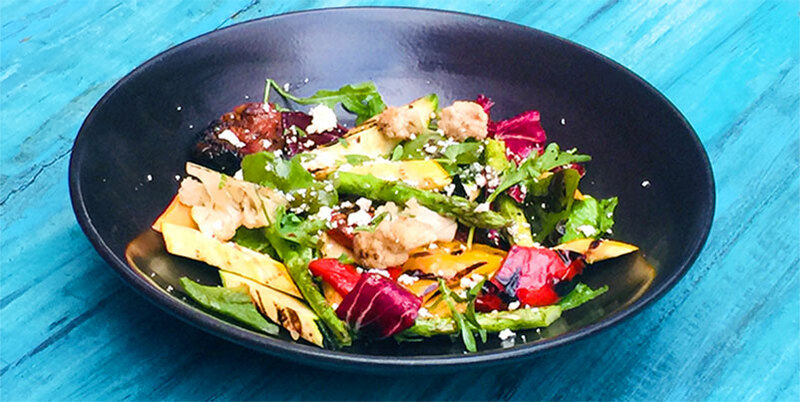 Fresh shiitake & oyster mushrooms stir fried with tomato sofrito, zucchini flowers, rocket & jalapeno crema. Black beans slow cooked in spices, blended & finished with epazote & home made cheese. Extra serving of deep fried cubed potatoes. are Churros from Asia or not?? 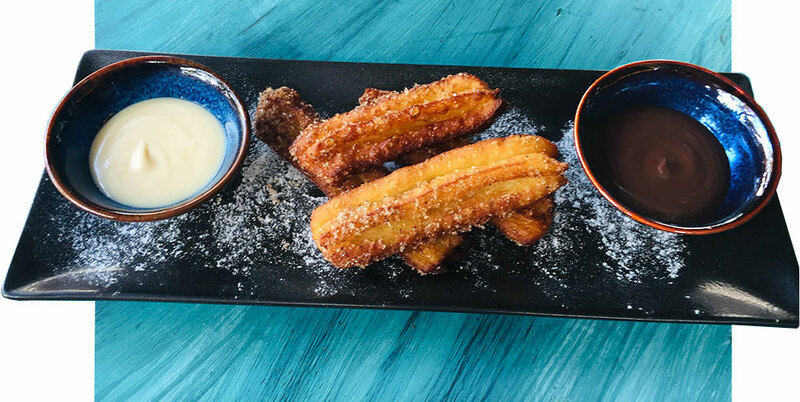 The Portuguese made them back home in the Iberian peninsula, but they added sugar, which is essentially how the churro, as we know it today, was born. The Chinese Youtiao (Lit. 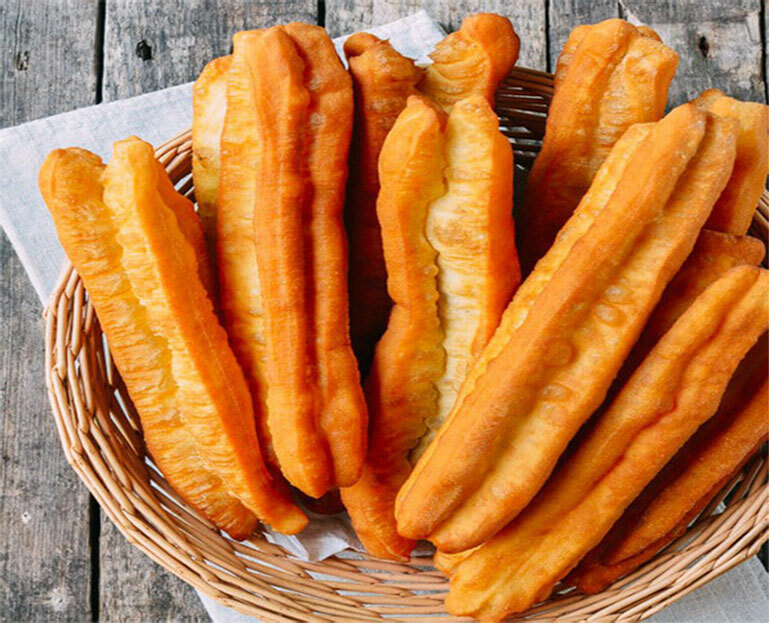 Old-fried devil) is a snack that was original served in pairs, as a symbol for the Song dynasty official Qin Hui & his wife. In Spain, the name Churro took its name from the churra sheep, since it resembled this animal’s horns. In the sixteenth century, Spanish conquistadors were the ones who introduced them to Latin America, including to the area which would eventually become Mexico... You believe or not? A delcious flour based dough that is deep fried to crispy.. then we roll it in cinnamon sugar. Served with our home made chocolate sauce & sweet caramel sauce.. the only way to conclude your mexican culinary experience. 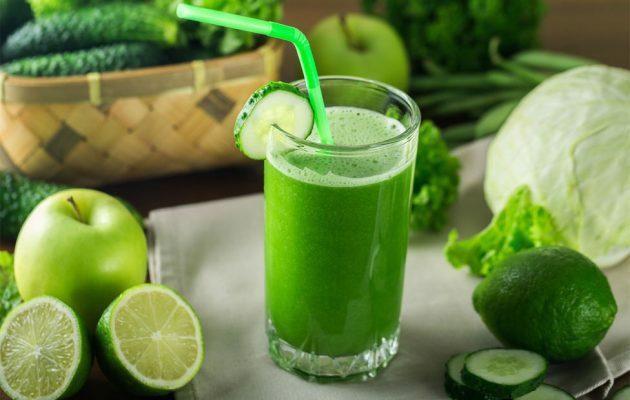 A refreshing & healthy (Ouch!) 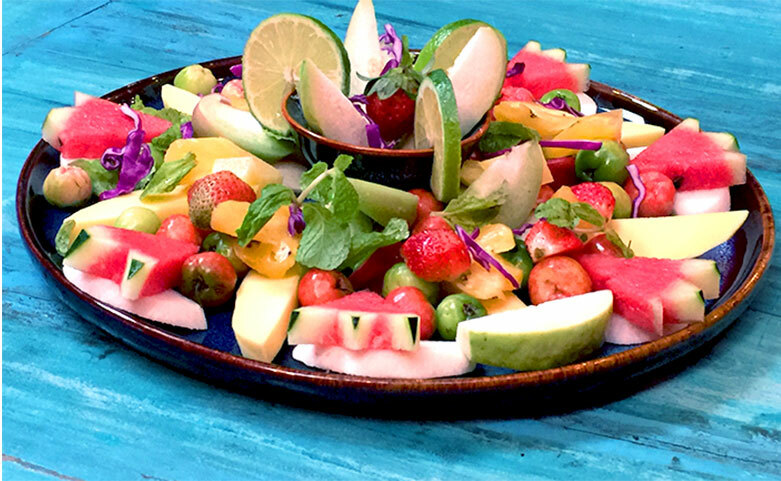 mixed platter of seasonal fruits. 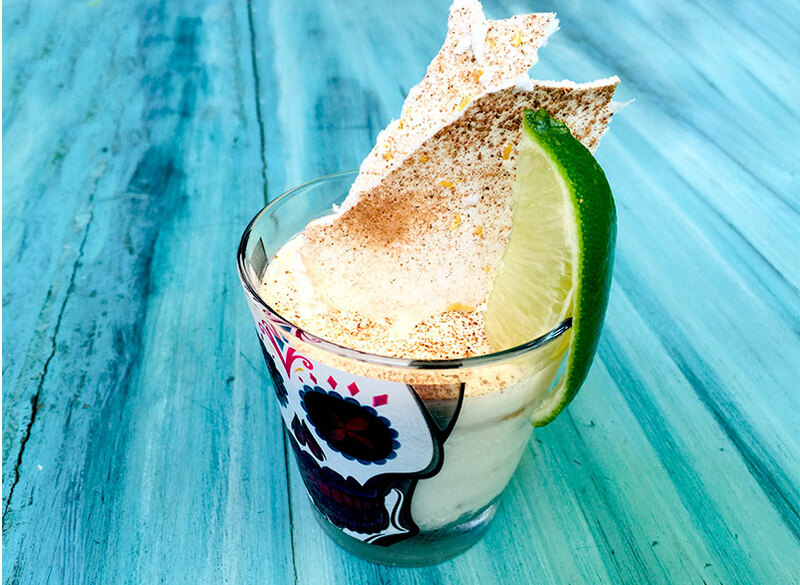 Carlota de limón (Lime Charlotte) is a Mexican home-style dessert. It's made with layers of cookies & a creamy mix made out of canned milk & lime juice. Dusted with cinnamon to finish the masterpiece! 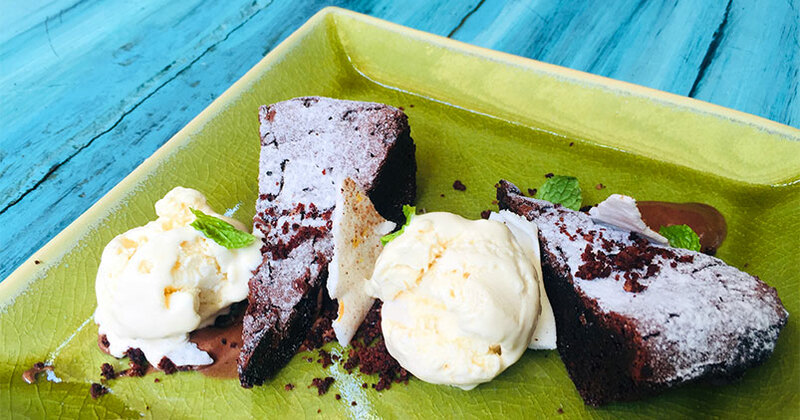 Soft gooey chocolate & mild chili brownie, served with chocolate moouse & vanila ice cream. Not spicy, OK for kids! Vanilla Ice Cream . Chocolate Ice cream. 2 fried corn tortillas stuffed with chicken tinga, creamy green chili salsa, fresh cheese, sweet corn. Served with Mexican rice & refried beans. Mexican “Ranch Eggs”, two fried eggs topped with DF red salsa, diced avocado, fresh cheese & crema. Served with Mexican rice & refried beans. 2 Fried tortillas topped with red & green salsa, 2 fried eggs, fresh cheese, diced avocado & crema. Served with Mexican rice & refried beans. Mexican scrambled eggs with cream, onions & tomato, served on 2 tortillas. Served with guacamole, Mexican rice & refried beans. 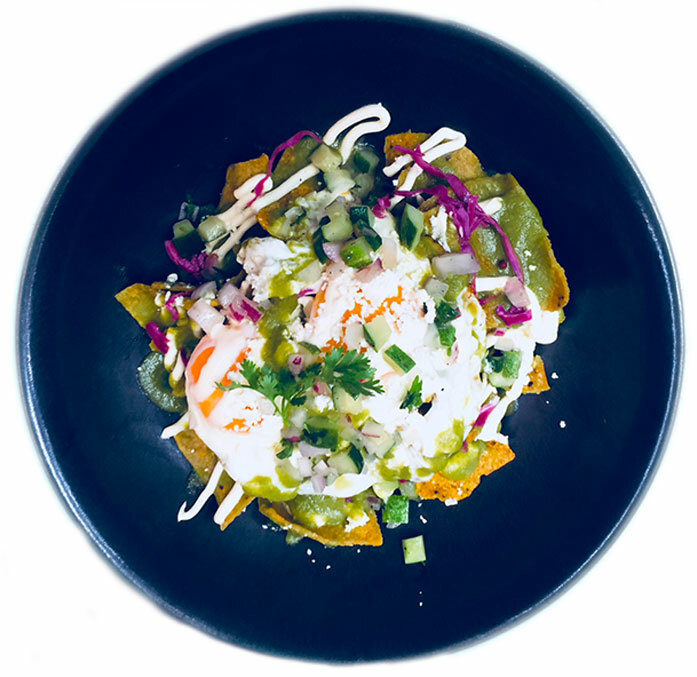 Homemade corn chips tossed in green chili sauce, topped with 2 fried eggs, red cabbage cucumber & onion Pico de Gallo, crema & fresh cheese. Flour tortilla stuffed with a choice of Mexican scrambled eggs or potato with chorizo & a fried egg. Topped with grated cheese & crema. Served with Mexican rice, guacamole & refried beans. 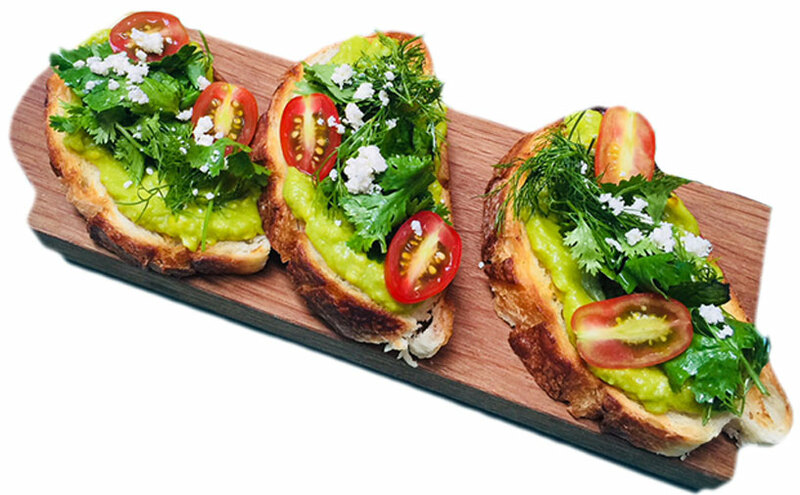 Fresh guacamole on crusty sour dough toasts.Topped with cilantro, dill, fresh cheese & cherry tomatoes. 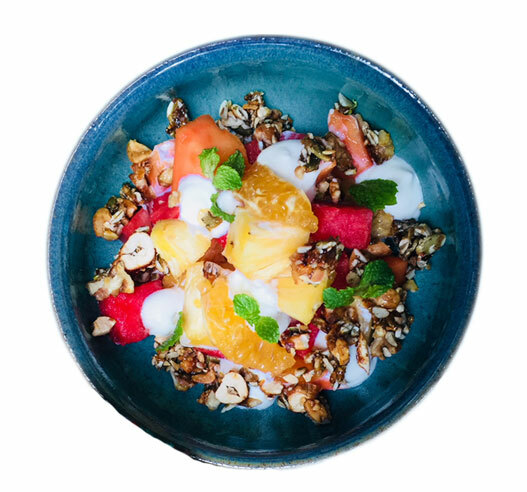 Seasonal fresh fruit bowl topped with homemade DF granola & Greek yogurt. popular dish in the Yucatan southern region of Mexico. with tomatoes garlic, Guajillo & Pasilla dried chilis. with a fresh mango salsa. Served with steamed wild rice & a green salad garnish. Dark Rum. Pineapple. Lime. Angustura Bitters. Vodka. Rum. Patron Silver. Gin. Martini. Bourbon Whiskey. Orange. Pomelo. Lime. Dark Rum. Lime. Plum. Sugar Cane. Tabasco. Pineapple. Egg White. Dark Rum. Patron Citronage Mango. Pineapple. Orange. Grenadine. Mexican Horchata. Dry Martini. Vodka. Patron Incendio . Cinnamon. Clamato Juice. Lime. Tabasco. Salt. Coronita. Fresh Fruit. Red Wine. Orange. Lime. Brandy. Blended Tomato. Lime. Orange. Onion.Jalapeno...Patron Tequila on the side. Fermented pineapple skin . cinnamon . star anise & lots of ice..
AND ANYTHING ELSE THAT’S HAPPENING AT DF. Never tried authentic juices from Mexico? DF is Not just about Tequila..
Vietnam is all about family and Mexico alike. 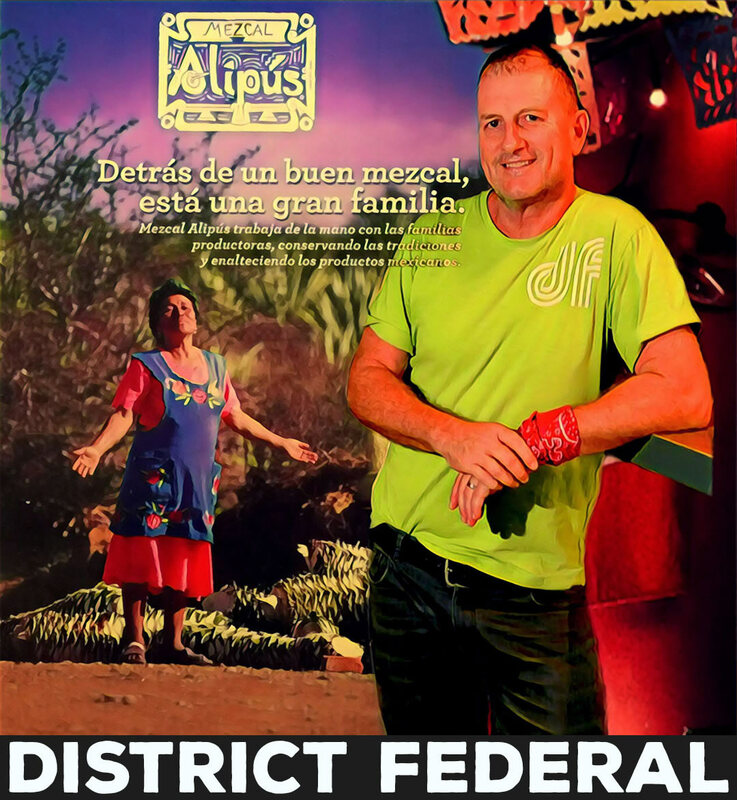 The journey to create District Federal was and still is about family. With the unbounded support and dedication from my family, my Hanoian wife Le, who is 100% the “Better half”, the brains and unsung hero behind the scenes ,has been, and continues to do all the important stuff to get DF up and running. 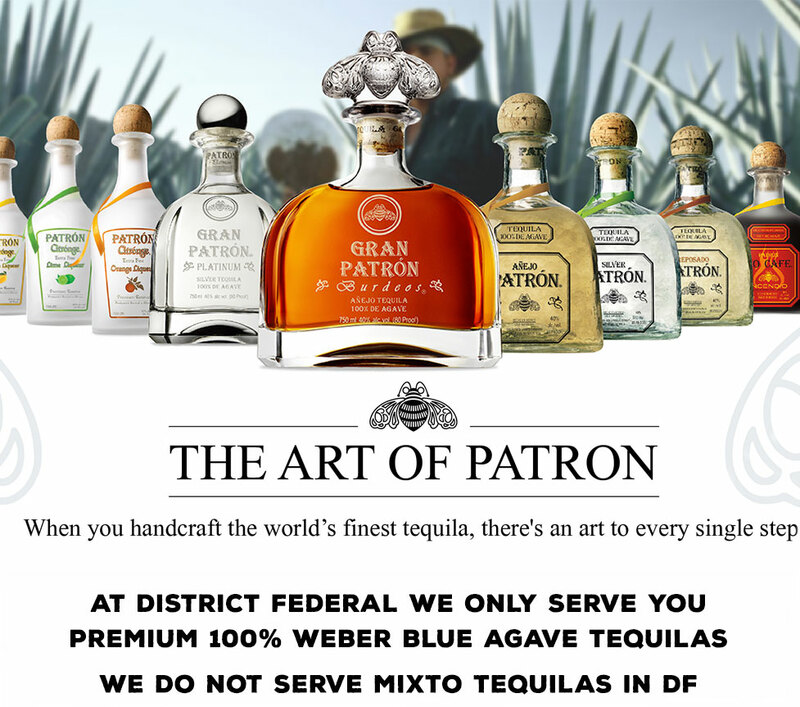 The DF Familia, in the kitchen, on the floor and in the bar…we are all one big family and with most families we are growing day by day. 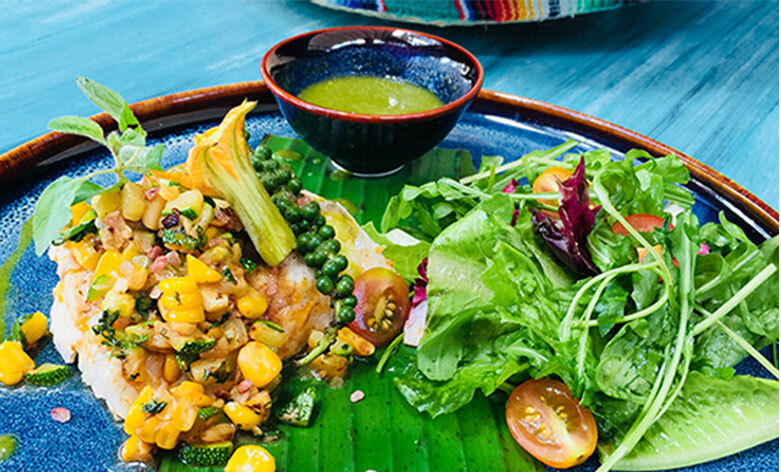 I kidnapped a Mexican Chef from Mexico City to ensure we brought the authentic tastes and flavors of Mexico City to Thao Dien in District 2 of Ho Chi Minh City, for you to enjoy. I wanted us to make everything fresh and we have been working towards achieving that end. 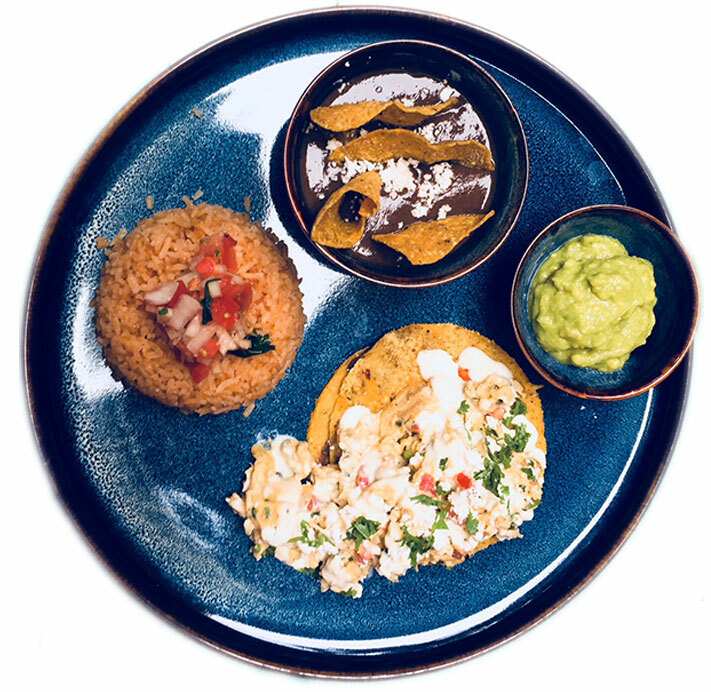 The tacos, chips and tostadas are made daily from homemade corn masa, the salsas, queso fresco cheese and slow cooked meats are also prepared daily. I designed a space that is casual, obviously very Mexican, bright, and colorful with 2 distinctive areas for dining. An open-aired front section, which looks into the open La Cocina (The Kitchen), where you can enjoy the Loco atmosphere of the busy cocina, and see our chefs prepare your food...…with nothing hidden. 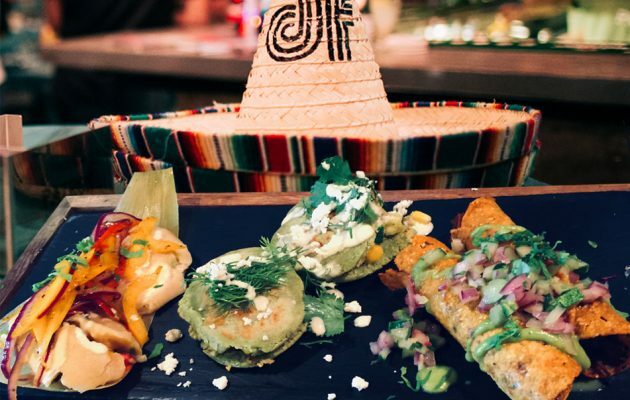 We endeavor to create a vibrant, cool and fun environment at DF, where you can enjoy authentic Mexican food, great drinks in a truly Mexican atmosphere. Department of Planning and Investment.